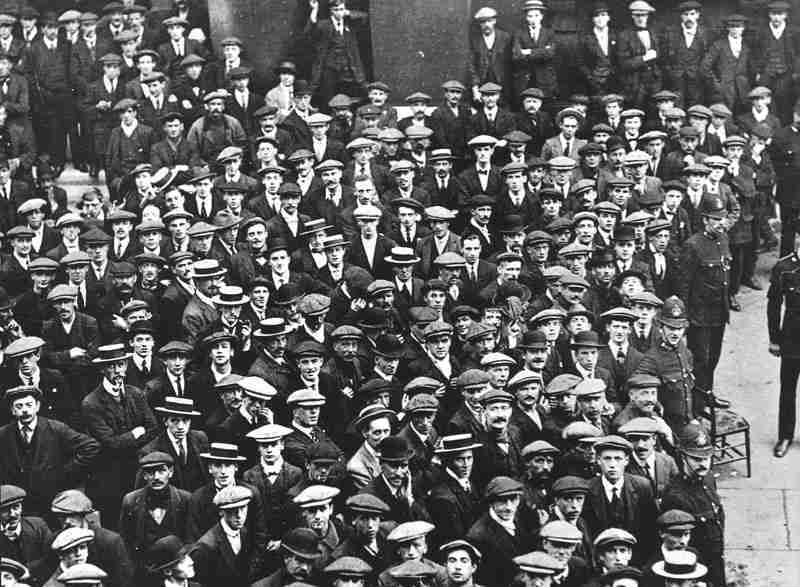 British recruits gather in central London. Like thousands of young men across Europe, many saw the war as a great adventure. The Belgian government rejects the German ultimatum (0700 hours) demanding that its forces have free passage through Belgian territory and also receives confirmation that Britain and France will provide armed support to combat any German attack. Sir E. Grey tells Commons ‘… we cannot issue a declaration of unconditional neutrality’. Lord Morley resigns from Cabinet because of the war. BRITISH GENERAL MOBILIZATION. Asquith approves Anglo-French naval co-operation and Admiralty Shipping requisition authorized. Germany declares war against France after falsely claims French aircraft have bombed Karlsruhe and Nuremberg. German cavalry cross frontier at Gemmenich. Joffre meets his 5 army commanders in Paris. Grand Duke Nicholas Russian C-in-C. Moltke tells Conrad Germany will only defend East Prussia. In Poland Germans invade and occupy Kalish, Chenstokhov and Bendzin. In North Sea first merchant ship lost: British SS ‘San Wilfrido’ (6458 t) sunk by German mine off Cuxhaven. French Mediterranean Fleet sails from Toulon for Algeria to convoy transports of 2 divisions to France. Much to the annoyance of its partners in the Triple Alliance – Germany and Austria-Hungary – Italy declares its neutrality. The Italian government argues that Austria-Hungary’s attack on Serbia is an act of war not covered in the essentially defensive provisions of the Triple Alliance treaty. Despite ailing King Karol’s wish to join Germany and Austria-Hungary, his government opts for a position of armed neutrality. However, a secret government agreement with Russia made in early October agrees that Romania will gain territory if Russia’s armed forces are successful in their war against both Germany and Austria­-Hungary. Evidence of Romania’s true interests becomes clear on October 23, when it closes its borders to German supplies bound for Turkey. Turkey declares its armed neutrality and mobilizes its forces. Enver Pasha becomes Deputy C-in-C to Sultan. Australia offers HMG RAN and 20,000 troops. French Army deserter and Telefunken electrical engineer Paul Pichon hands over in Paris latest radio audion valve (US de Forest design): 100,000 supplied to French forces by end.